A variety of adhesives are used in many different art, technology, and maintenance applications. Types of adhesives range from nontoxic children's paper pastes to highly toxic casein glues and rubber cements. Adhesives can contain hazardous solvents, plastics, and preservatives. Many adhesives contain solvents that are toxic by inhalation and skin contact. For example, rubber cements and contact adhesives usually contain n- hexane, which can cause peripheral neuropathy. Glues used in furniture repair, leatherwork, etc., often contain hazardous solvents like toluene and naphthas. These are hazardous by skin contact and inhalation, and most are flammable. Some adhesives work by polymerization of hazardous monomers. Epoxy hardeners can cause skin and respiratory irritation and allergies. Epoxy resin is irritating, can cause allergies, and certain ingredients like diglycidyl ethers are suspected carcinogens. Acrylic plastic glues can contain methyl methacrylate, and instant bonding glues contain cyanoacrylates. These ingredients are skin sensitizers and irritants, and the vapors may cause headaches, appetite loss, and low blood pressure. The cyanoacrylate glues can also bond skin. Woodworking glues range from nontoxic polyvinyl acetate (PVA) emulsion glues that are water-based, to hazardous resorcinol formaldehyde resins that release formaldehyde gas. Formaldehyde is a skin, eye, and respiratory irritant and sensitizer, and is a suspected human carcinogen. Other wood glues may contain toxic phenol preservatives. 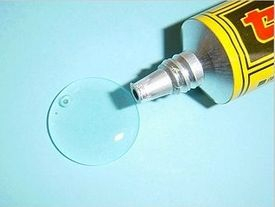 Aerosol adhesives are sprayed, resulting in the inhalation of rubber or plastic particles, along with the inhalation of various solvent and propellant ingredients. N-hexane is a common solvent used in these spray formulations. Both solvents and aerosol propellants are fire hazards. Wheat paste -- especially the wallpaper paste variety -- often contains toxic preservatives, such as pentachlorophenol, arsenic, or mercury derivatives. Wallpaper pastes with these toxic ingredients have sometimes been found in elementary schools. 1. Substitute the safest glue possible. Try to use water-based adhesives, especially with children. These may take longer to dry, but can efficiently and safely do the job. One can substitute glue sticks for rubber cement for adhering paper in elementary schools. Only use nontoxic wheat pastes that do not have preservative additives. 2. For paste-up of mechanicals and similar processes using rubber cement, waxing often can be substituted. 3. Use solvent-based glues in a well-ventilated space (e.g. window exhaust fan). If large amounts are being used, local exhaust ventilation such as a slot exhaust hood is necessary. Placing the work table up against a window with an exhaust fan at work level is also effective. Eliminate all sources of ignition such as flames, sparks, or lit cigarettes. 4. Spray adhesives could be used outdoors for occasional projects, or in a spark-proof spray booth that exhausts to the outside. Spray adhesives can sometimes be replaced with dry mounting processes, rubber cement, etc.